Our 2017 Larapinta Gutsy Challenge trek set off on Sunday 6th August. 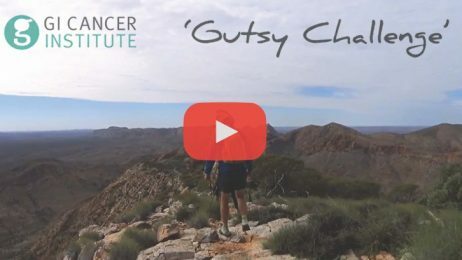 A team of 17 people, including a number of medical researchers and their supporters, from around Australia committed to this 80km trek challenge and they were busy for the 9 months prior raising vital funds for GI cancer research. The group included Adam Harvey, son of the late Peter Harvey who died from Pancreatic Cancer in 2013, and Dr Lorraine Chantrill, a medical oncologist specialising in Pancreatic Cancer and GI Cancer Institute Board member. They’re grim statistics but the GI Cancer Institute’s new cutting edge research is making progress through developing better and more targeted treatments. With the public’s help, we can conduct more clinical trials and provide more hope to the 24,600 Australians diagnosed with gastro-intestinal cancers each year. If the trials are done in Australia, local patients will be able to access treatment options much faster than if the treatments are tested overseas. For Dr. Lorraine Chantrill, taking part in this trek was also very personal. 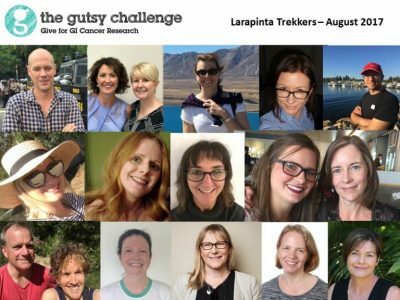 Meet the team or donate here!